Jack Dorsey, co-founder of Twitter, posted the first ever tweet. “just setting up my twttr,”At only 24 characters, the first tweet was way within Twitter’s 140 character limit. Jack Dorsey mentioned Twitter as twttr is because that was the original code name for the project. The public launch of what was to soon become the world’s most popular microblogging platform happened a few months later on July 15, 2006. Since then it has been eight year since different tweets of its own kind. Here are a selection of seven first-of-its-kind tweets on the eighth anniversary of the first tweet. To celebrate the occasion Twitter has launched a tool to let you discover yours or anyone else’s first tweet. The first tweet from outer space was posted by NASA astronaut TJ Creamer from the International Space Station. Sarah from Geraldton, Australia posted the news about her pregnancy on Twitter. The first known pregnancy announcement tweet. Sam Sethi announced on Twitter that he was fired by Michael Arrington from TechCrunch. The first tweet personally posted by US President Barack Obama wasn’t from the @BarackObama account, but a tweet on @redcross written in the third person. Barack and Michelle Obama were on a visit to Haiti following the devastating earthquake. Launched http://fivelimes.com even though it’s pretty basic….getting it out there – @raja (Raja Bhatia) at 6:25 AM (PST) October 28, 2006 via web. Raja Bhatia announced the launch of fivelimes.com, a social bookmarking site for eco-friendly products, via a twitter post that he seems to have since deleted. Don’t we love to find an Indian connection to any top lists. So here it is, the first Tweet sent out by an user of Indian origin. Nothing profound in the Tweet, but a first nevertheless. 8. That’s me, my first tweet. OK …..i guess u r too busy with ur IDIOT theme. Tweeted by me (@jayaditya911), tweeted on June 3,2010 expressing some kinda irritation as I could not be able to change themes and they looked too simple and plain. 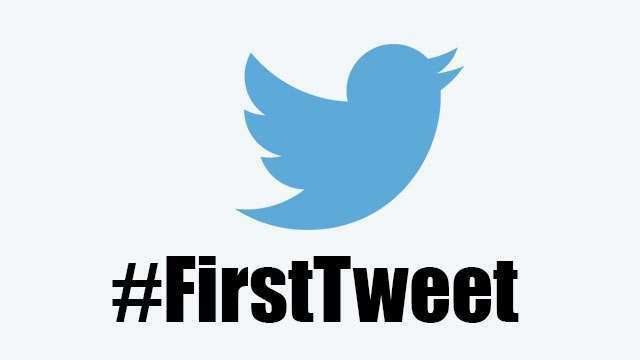 Let us know about first tweet, in the comments section below. Happy tweeting! !